Collins and his team of researchers used strict benchmarks to identify a group of eleven elite companies that made the leap from good to great and sustained that greatness for at least fifteen years. The companies that made the list might surprise you as much as those left off (the likes of Intel, GE and Coca Cola are nowhere to be found). The real surprise of Good to Great isn’t so much what good companies do to propel themselves to greatness — it’s why more companies haven’t done the same things more often. Here is a summary of things you will Learn from his book Good to Great a number 1 best seller. ✓ Celebrity executives almost never lead good companies to greatness. Good-to-great leaders embody a paradoxical mix of personal humility and professional will. ✓ You can’t achieve great things without great people. Many companies create strategy, then try to rally people around it; good-to-great companies start with great people and build great results from their efforts. ✓ Simplicity rules. To go from good to great requires leaders to know what their organizations are passionate about, what drives their economic engine, and at what they can (and cannot) be the best in the world. ✓ Enterprise-wide discipline is essential. When you combine a culture of discipline with an ethic of entrepreneurship, you are more likely to achieve great results. ✓ Technology is an accelerator. Good-to-great companies do not jump on technological bandwagons or chase after fads. They determine what technology makes the most sense for them, then pioneer its application. Today I want to focus on Jim Collins point 4 that it’s essential to have a culture of Discipline, I’m going to provide a some free resource that will give you the time to make better/faster decisions. Last week we focused on the importance and power of having a Daily Huddle. Today we are going to focus on the weekly leadership meeting, provide specific outlines & agenda’s with recommendations on who should attend meetings and which meetings so they are productive. Before we dive into our episode I am extremely happy to inform you we have extended the Small Business Growth Challenge contest until April 6th ! The faster you grow, the more chaotic your business environment, the faster your business pulses and the more important it is for you to establish and sustain effective communication within your company and your team. Done properly, the daily, weekly, monthly, quarterly and annual strategy planning days will deliver some extremely valuable tangible benefits to you and your team. Having more frequent routines makes it easier to attain goals. This is why the daily, weekly, and monthly meetings are critical to business success. They drive the deliverables outlined in the less frequent meetings, with each meeting building upon the next. 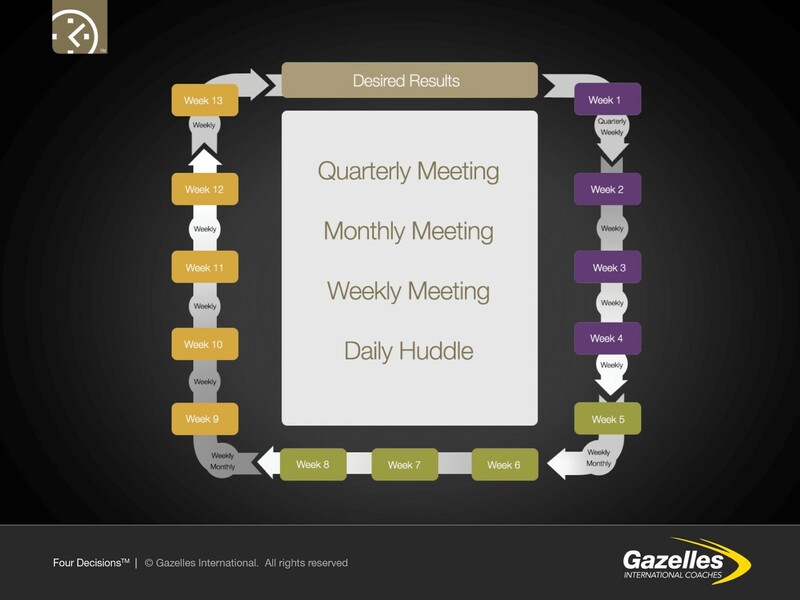 If your huddles are functioning well, they will lead to immediate action on scores of issues that would otherwise clog up the weekly meeting. You don’t want to spend the weekly meeting poring over updates. Everyone should be well informed via the daily huddles. You also don’t want to address the dozens of issues that have accumulated over the week. 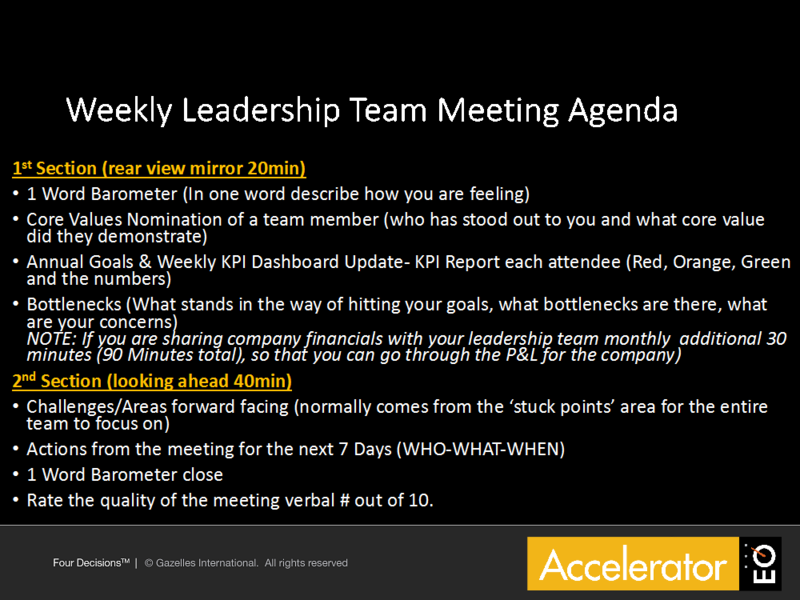 The idea of the weekly meeting is to keep everyone lazer focused on the #1 priority that supports your mission. You want to tap the collective intelligence of the team for 30 to 60 min on 1 or 2 important topics. This affords the group an opportunity to resolve 50 to 100 important things in a year. First section is what I call the rear view mirror section which warms up the brain and allows your team to share enough internal and external data to help the team see patterns and trends in the performance of your company. Second section is all about looking forward and designated for putting the team’s collective intelligence to work and making important decisions. Take 40 minutes to focus on one or two key topics usually they come from the 1st section when talking about stucks or what to focus on. These could be topics like potential partnership opportunity or priorities your focused on that quarter. Last part of the meeting is a one word close and then have everyone do a verbal rating on scale 1 – 10 on the meeting. I would rotate the leader of the meeting each week. It’s great to also send out a weekly one pager to all the staff updating them on the status of the #1 Priority and important developments from the meeting and inside the company and the industry. Hope you enjoyed this episode as much as I did and I’ll be back next week with the next section on monthly & quarterly management meeting which focuses on education & bigger issues of opportunities that surface around strategic thinking. We will end this series with a episode on Annual retreats – Averaging 2 days each year, this is where the old plan is assessed, the current realities are tested, and the new plan is formulated.